We were on our amazing cruise from Athens through Dubai and onto Cape Town. When booking the cruise, we were concerned about the political instability in some of the countries we visited. We had given far less thought to the fact that we were cruising through pirate country. If someone tells you that pirates are for storybooks, let them read this blog. Piracy is still a common issue in many different parts of the world. We had barely been on our cruise for 2 days before we got our first notice that talked about the risk of piracy. Our cabin steward had actually been on our cruise ship a few years ago when it was attacked by pirates. She gave us a high level view of what the process was for a pirate attack. A few days later we had a pirate drill. 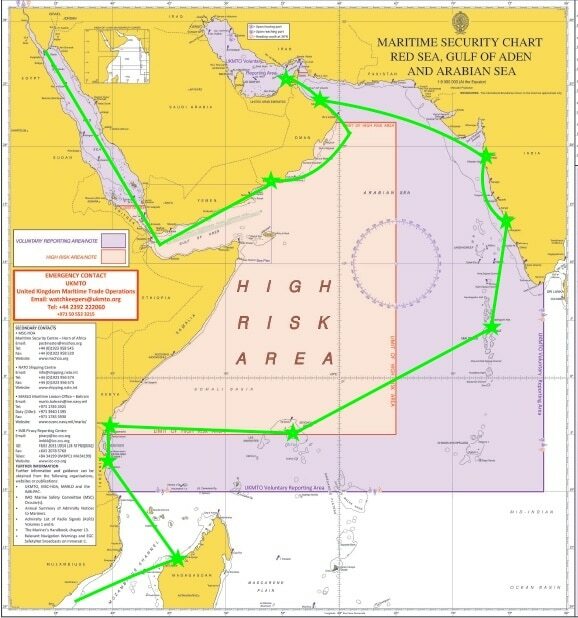 Our cruise ship passed right through the High Risk Area (HRA) in the Gulf of Aden. We were in the HRA for over 10 days. When not in the HRA, we were in the Voluntary Reporting area for over 22 days. On a 51 day cruise, this was a lot of time cruising through pirate country! When we told our family and friends at home about the pirate note, they all were quite shocked. We reported in regularly when the pirate risk was high. When we finally put the pirates behind us, everyone took a big breath. The key requirement for passengers was to get as far away from the windows as possible. 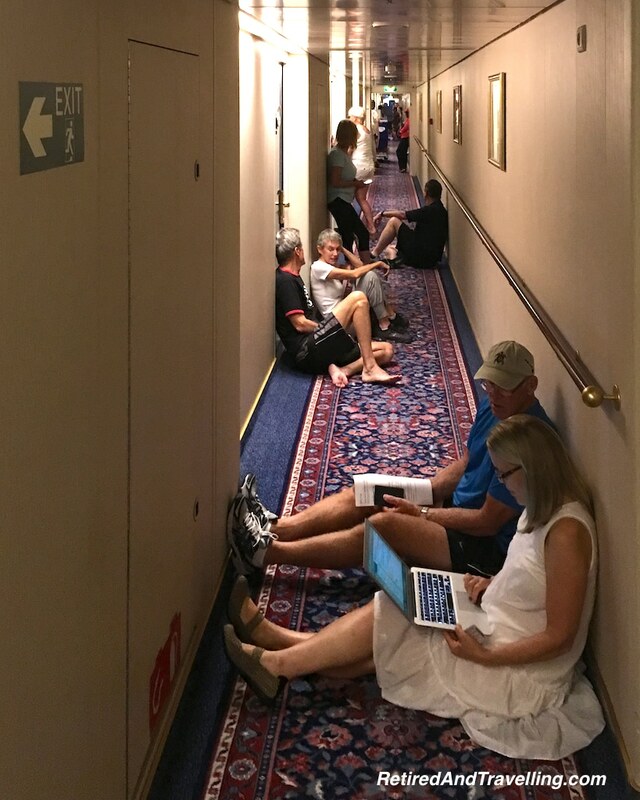 We all moved to the inner corridors and sat on the floor until the drill was finished. While we were hunkering low, the ship’s team was practicing the drills for repelling pirates. The ship will put on speed and try to maneuver away from the pirates. They will move the ship so there is no leeward side to help the pirates board (e.g. put the ship into the wind). 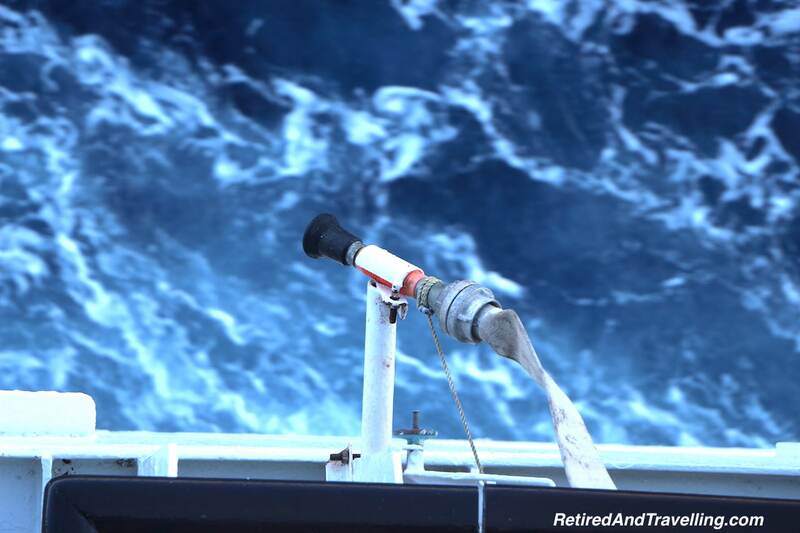 High pressure water hoses are mounted on the deck to spray on the pirates. Loud acoustic noises are also used. When we cruised through the HRA, there were additional measures put in place. The ship lights were turned off on the outer decks. Passengers were told to keep lights off and curtains closed in their cabin. The main dining room actually closed all curtains one night at dinner. 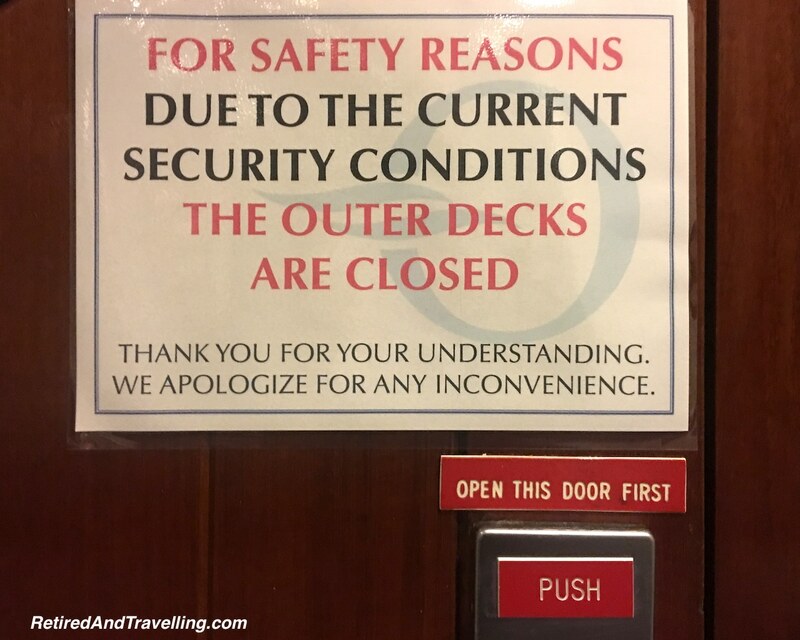 And the outer decks were off limits after dark. This was how we handled cruising through pirate country. Piracy in Asia in the Straight of Malacca was a very recent reality. This may be the busiest pass for trade, with plenty of targets (>50,000 ships per year). A great number of rivers also provide a place for the pirates to hide. In 2005, Lloyds listed Malacca as worst pirate zone and added “war risk” insurance. This created such a controversy that the governments of Malaysia, Singapore and Indonesia took concerted action to patrol this region. This action reduced piracy dramatically and the “war risk” insurance requirement was removed. In 2012, 300 pirate attacks in the Gulf of Aden scored the pirates $300Million. While the numbers have dropped since 2012, in 2016 the numbers started to rise again. Piracy is a ferocious and big money business. And each year the pirate’s weapons get bigger. Modern piracy is done for two main reasons. They may attack a ship opportunistically for personal property or to hijack the ship for resale. This type of attack is seen mostly in the Caribbean. The pirates we might encounter cruising through pirate country tend to hold the ship and people for ransom. Small groups can attack large ships. Cargo ships have become much more automated. With much fewer crew members, there are less people to repel an attack. The ship can be taken over with fewer heavily armed pirates. Problems are made worse because the pirates generally get the ransom money. Somalia is a hotbed of piracy. The new government and the small fishing ports on the coast have served as a haven for the pirates. Fishing illegally is often stated as a trigger for the growth in piracy. Foreign trawlers came to the Somalia coast to fish the verdant waters. Boats were sunk, nets were destroyed and Somalians were killed by these trawlers. The coast was also used to dump toxic waste. Somalis armed themselves and started to capture these illegal trawlers and ransom them. The corrupt governments capitalized on this issue. They began selling licenses to foreign ships, at the expense of the local people and local fishing. Current piracy has spread to the coasts of Yemen and Kenya. Each piracy mission requires venture capital to fund the purchase of boats, arms and staff (cost can exceed $10K). It is highly profitable for venture capitalists who get 50% of any ransom taken. Pirates get 30%, land militia get 10% and the local village gets 10%. If a pirate gets killed, the family gets the money. The first person aboard gets the highest payment. $350 Million went to pirates in 2005 to 2012 or about $30-55,000 for each pirate (100x the average wage in Somalia). It is no wonder that piracy continues. Investors have a “recruitment” plan for selecting pirates, very much like gangs. Those who board first are in high demand (and they get double $$). Is a Cruise Ship at Risk? If they can get millions for cargo ships, imagine what they could get for a ship full of passengers! But attacking a cruise ship is not as easy as a lightly manned cargo ship. The cruise ships can go faster and they have much bigger crew. But it has happened! The Seaboard Spirit attacked by pirates in 2005. The cruise ship managed to repel. When it was attacked a second time, the British sent a helicopter and the pirates scattered. In 2008, the Oceania Cruises Nautica (the cruise ship we were on) was attacked enroute to Oman. 6-8 boats circled the Nautica. The ship took evasive action. Pirates opened fire at range of 1000’. No person aboard was injured and no damage was done to the ship. In April 2009, MSC Melody was attacked by 6 boats. An onboard team of Israeli private security people fired water at the pirates trying to put ladders on the ship. The issue of modern piracy was depicted in the Tom Hanks movie “Captain Philips”. It depicts the pirate capture of a cargo ship. That same ship was attacked a second time but that attack was repelled by armed guards. There is a lot of talk about whether ships should be carrying arms. But if the ship is carrying arms, it can only dock at certain ports. Some ships will take on extra security for parts of a journey. But having arms on board raises the stakes for all and increases the risk of injury. Piracy has spawned a new industry for “floating armouries”. It is a popular option for container ships but cruise ships do not use them. In 2014, the “Contact Group” formed a coalition to fight against the pirates (84 nations have joined). The group is providing naval patrols. This has decreased the pirate attacks and has resulted in the capture of many of the pirates. To-date, about 1,400 pirates have been jailed. They will be repatriated back to Somalia after their sentences. The last of 26 hostages that were captured in 2012 have finally been released. During 4.5 years of captivity they were mistreated by pirates who believed they would get ransoms. But the last of the hostages had no ransom money. A small payment was eventually negotiated for “cost of care of the hostages”. 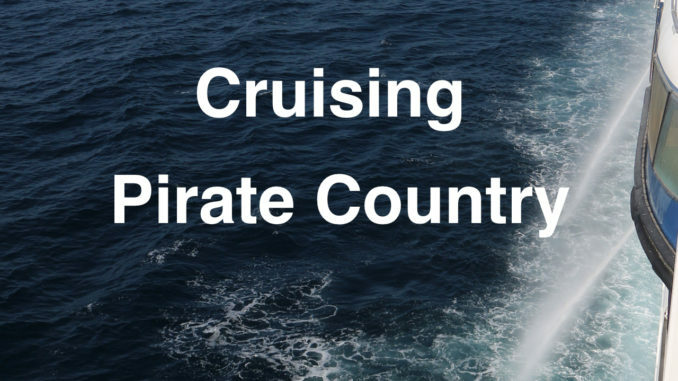 If you travel in many waters, there will be a risk of encountering pirates. While the probability is much reduced at this time, it is a risk that the cruise ships take seriously. There are pirate drills for the staff and passengers. Counter-measures onboard are tested and practiced. While it was something we were aware of, it was not something that would have caused us to cancel the trip. Cruising through pirate country added an interesting element to an already amazing trip. Have you been cruising through pirate country? Did you see pirates? Would this cause you to pass on a certain cruise route? WOW! Loved this Linda as I knew nothing about cruising thru pirate country! Have only cruised once to Alaska so far but this was certainly food for thought. But I guess it’s like anything else, if you want something bad enough, you’ll take chances!